Researchers from the University of Chicago reported on the results from a small trial aimed at patients with advanced metastatic urothelial cancer (UC). Many UC patients frequently have somatic mutations and copy number variation in the ERBB gene family, which are structurally related the epidermal growth factor receptor and the development of a wide variety of solid tumors. The trial was designed to see if daily 40 milligram doses of the drug afatinib, a tyrosine kinase inhibitor typically given to non-small cell lung carcinoma patients, could prevent tumor progression for at least three months in patients who had developed resistance to the first-line treatment for metastatic bladder cancer. A total of 23 patients were enlisted in the study, of which seven had HER2 and/or ERBB3 mutations. Among the patients who had one of the two mutations, averaged 6.6 months without progression of their cancers after treatment. That was more than four times longer than patients without the mutations, who averaged only 1.4 months. 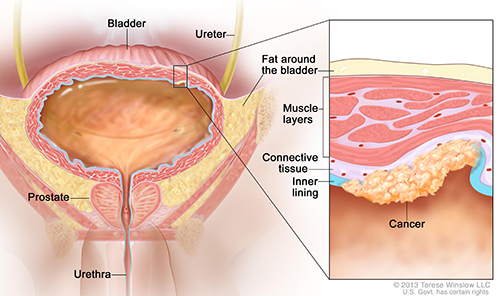 Urothelial carcinoma (UC) is the fourth most common cancer among males and, at 16,000 deaths a year, the eighth leading cause of cancer death in the United States. It affects the kidney, urinary bladder, and accessory organs. In the last 25 years, there has been limited progress in developing effective new treatments for UC with the authors stating that platinum-based therapies are currently the only standard of care, with no approved second-line therapies. In the current study, two patients had a partial response (some shrinkage of tumor), while seven had stable disease, and 14 had ongoing progression of the disease. However, the key finding was that five out of the six patients with molecular alterations in at least one of two specific genes—multiple copies of Her2, or mutations and multiple copies of ERBB3, abnormalities associated with a worse prognosis in previous studies—responded to the treatment.